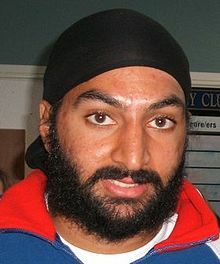 Monty Panesar (born 25 April 1982 in Luton, Bedfordshire). Monty Panesar is an English test cricketer, who is a specialist left-arm spinner. Over the past few years, he has become an integral part of the English test team, taking over 150 test wickets at an average of 32. A popular cricketer, Monty Panesar is the first Sikh to play for England and wears his trademark black patka, (small sikh turban) when playing cricket. His batting and fielding are weaker parts of Monty’s games. In the past he has been criticised for his poor fielding, and in batting, he struggles to average in double figures. However, his bowling has sometimes won games for England, making his inclusion in the side quite a regular occurrence. Panesar made his first class debut at aged 19, and also was selected for the England under-19 team. After graduating from Loughborough University with a degree in computer scient, he played for Northamptonshire, taking 46 wickets at an average of just 21.54 in his first season. Panesar was selected for his first international tour in January 2006. He made his debut in Nagpur, India, taking three wickets. Monty has become a firm favourite of English fans for his different appearance, sometimes entertaining batting, occasional hapless fielding and good bowling performances.